This is the third work-day where we have had volunteers in. We started around 9am with people actually arriving at about 9:15am. We provided donuts and coffee for the workers to eat and drink with of course the full cooler of water bottles. The day went pretty well with most of the railings going up, the ladder being installed, and a few other supporting braces being installed. We also added a couple extra support posts to give the platform the extra strength it should have. In between all this we stopped for a delicious lunch comprised of TACO BELL tacos and burritos. We ended early with the two predicaments of needing extra hardware for the rail kits and the fact that all the screw guns’ batteries had died and none would charge quickly enough. The tasks left to do include: completing the last two sections of railing, bolting the railing posts in their permanent place, assembling the climbing wall, and installing the steering wheel. Eagle Project Day 5 (Day 2 with Volunteers)Early in the morning, at about 9am, the 6.5 tons of gravel arrived. 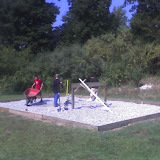 With a handful of workers we were able to spread all the gravel rather evenly after about an hour to an hour and a half. Just as we had finished spreading the gravel, the wood chips arrived right on cue and dumped the 10 cubic yards of mulch in two huge piles. While this is all happening, posts are prepared and the other beam for the larger, shorter platform is installed. As more workers arrive we finish the main frame of the platform and break for lunch. After a well-balanced lunch of pizza and soda, the decking is installed on the larger platform, the tire climber is assembled, and the posts/beam are installed for the adjacent platform. Soon all the decking is on the higher platform and the platforms are all braced. The tire-climber is attached to the structure, and things are touched up. A lot has been done, but there is much more waiting to be done tomorrow. The railings, ladder, and climbing wall all have to be assembled and installed. Today we got a good amount done in the few evening hours that nature provided. Beginning at 4pm and ending at 7pm we completed the containment box to hold up the gravel and woodchips. In addition to that, we got one beam up with two posts supporting it. Tomorrow we will start bright and early so we can get the gravel all spread out that is scheduled to arrive. Following the gravel, the delivery of woodchips should arrive.